One of the more eyebrow-raising omissions from the German World Cup squad was the absence of Borussia Mönchengladbach’s Max Kruse. Kruse, 26, had been tipped to be selected for the Nationelf, with the striker having scored once in six appearances for the German national team. Kruse was in the German side that beat England 1-0 at Wembley last November, and, indeed, that trip to London is being banded about as the reason Kruse is not going to Brazil with his countrymen. According to the rumour mill, Kruse broke team rules whilst in London as he reportedly invited a women into his hotel room. The Germans were staying at the Corinthias hotel, on the banks of the River Thames. 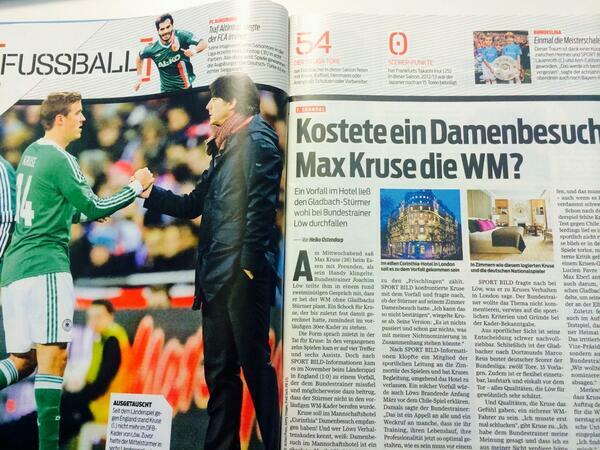 Looking to set the record straight, Kruse has now spoken to Bild to protest his innocence. There have always been many rumours about me… The coach knows what happened, I know what happened. The coach has told me in a private conversation that my non-selection was made on sporting reasons alone.